Liu, Y., Li, L., Li, X., Wang, Y., Ren, X., and Liang, J. (2016). "Antibacterial modification of microcrystalline cellulose by grafting copolymerization," BioRes. 11(1), 519-529. Microcrystalline cellulose (MCC) has the advantage of a high specific surface area as compared to that of conventional cellulose fibers. In this study the monomer methacrylamide (MAM) was used to treat MCC by grafting copolymerization. SEM, FTIR, and solid 13C NMR were used to characterize the morphology and composition of MAM-g-MCC. After the chlorination of MAM-g-MCC with 10% sodium hypochlorite solution, the grafted MCC exhibited antibacterial activity as a result of the formation of N-Cl bonds. The thermal stability, antibacterial ability, and storage stability of chlorinated MAM-g-MCC were also studied. The results showed that the chlorinated MAM-g-MCC had excellent storage stability and could inactivate all S. aureus and E. coli O157:H7 within 10 min. Cellulose, one of the most abundant natural materials, has garnered attention in recent decades because of its renewability, biodegradable characteristics, and availability from a variety of sources (de Oliveira Taipina et al. 2013). Cellulose is a branched linear polymer with numerous hydrogen bonds. It contains crystalline and amorphous regions and its crystal structure is cellulose I, a mixture of cellulose I-α and I-β in a parallel conformation of two anhydroglucose units joined by β-D glycosidic linkages (Eichhorn and Young 2001). After it is treated with acid, the proportion of amorphous region decreases; cellulose particles can be obtained at the micro- or even the nano-scale via acid hydrolysis. Microcrystalline cellulose (MCC), from which the amorphous regions have been partly removed by acid hydrolysis, contains a large amount of cellulose and has the advantage of high specific surface area as compared to that of other conventional cellulose fibers. MCC can easily be modified by monomers and imparted with specific functions. Jiang et al. (2012) found that chemical modification of MCC with cyanuric chloride was useful to increase the glucose yield from the hydrolysis of cellulose, making cellulose-based ethanol possible. MCC has also been modified and used as binding material to enhance the compatibility of various substrates (Mathew et al. 2005; Petersson and Oksman 2006). However, there have been very few studies of MCC with antibacterial properties. As one of the most powerful biocides, N-halamine compounds have attracted much interest in recent years given their rechargeability and high efficacy against various microorganisms, including bacteria, viruses, and fungi (Ren et al. 2008a; Zhang et al. 2013; Zhuo and Sun 2013; Liu et al. 2014). N-halamine precursors have structures of amine, amide, or imide. After halogenation, the nitrogen-hydrogen groups can be oxidized to form nitrogen-halogen groups, which can transfer oxidative halogens to microorganisms’ surfaces, destroying their cellular systems and killing the cells (Chen and Sun 2006; Kou et al. 2009). Some researchers have proposed that intact chloromelamine moieties may also have biocidal effects, inhibiting the growth of organisms if the free chlorines present in wet environments are not sufficient to inactivate tougher microorganisms (Chen et al. 2007). After organisms are inactivated, the oxidizing nitrogen-halogen groups are reduced to nitrogen-hydrogen groups that can be rehalogenated by sodium hypochlorite; the materials modified by N-halamine compounds have long-term antibacterial properties (Sun amd Sun 2001; Zhu et al. 2012). Given their ideal antibacterial activity, N-halamine compounds are widely used in surfaces such as fabrics (Lin et al. 2001; Liu and Sun 2006; Ren et al. 2009a), silica gel (Liang et al. 2006; Barnes et al. 2007; Cerkez et al. 2012), and paints (Cao and Sun 2009; Kocer et al. 2011a). A series of N-halamine compounds have been coated onto the cellulose surface, via hydroxyl groups, siloxanes, and epoxides, as tethering groups. 3-(2,3-Dihydroxypropyl)-7,7,9,9-tetramethyl-1,3,8-triazaspiro (4.5) decane-2,4-dione (TTDD diol) was coated onto the cellulose surface with the assistance of 1,2,3,4-butanetetracarboxylic acid (BTCA) as a cross-linking agent (Ren et al. 2009b). 3-Glycidyl-5,5-dialkylhydantoins, a copolymer of 3-chloro-2-hydroxypropylmethacrylate and glycidyl methacrylate, and 1-glycidyl-s-triazine-2,4,6-trione containing epoxides, can be coated onto cellulose via the traditional finishing method (Liang et al. 2007b; Kocer et al. 2011b; Ma et al. 2013). 3-(3-Triethoxysilylpropyl)-7,7,9,9-tetramethyl-1,3,8-triazaspiro(4.5)decane-2,4-dione, 5,5-dimethyl-3-(3′-triethoxysilylpropyl) hydantoin, and 4-(3-triethoxysilylpropoxyl)-2,2,6,6-tetramethylpiperidine were also bonded to cotton surfaces because of the presence of siloxane groups (Liang et al. 2007a; Ren et al. 2008b). Among the treatment methods mentioned above, a radical polymerization process was also used to produce antimicrobial cellulose. Acrylamide (AM) and methacrylamide (MAM) were grafted onto cotton by a radical polymerization process, and the treated fabrics provided rapid antibacterial activity against both gram-positive and gram-negative bacteria (Liu and Sun 2006, 2008). To the best of our knowledge, the modification of MCC by N-halamines has not been previously studied. In this study, MAM was used to modify MCC with N-halamine structures. MAM was grafted onto MCC by radical polymerization and the grafted MCC was characterized by FTIR, SEM, and solid NMR. The thermal stability, antibacterial properties, and chlorine stability towards the storage of the chlorinated MAM-g-MCC were also investigated. Microcrystalline cellulose (MCC) and methacrylamide (MAM) were purchased from J&K Chemicals, Shanghai, China. Sodium persulfate and other chemicals were purchased from Sinopharm Chemical Reagent Co., Ltd., Shanghai, China. Fourier transform infrared (FTIR) spectra were obtained using a NICOLET 10 FT-IR spectrometer (Nicolet Instrument Corporation, Madison, WI). A SU 1510 field emission scanning electron microscope (SEM) was used to characterize the surface morphology of MCC and MAM-g-MCC (Hitachi, Tokyo, Japan). The X-ray diffraction (XRD) patterns of MCC and MAM-g-MCC were detected by a Bruker Instrument model D8 in a 2q range of 10 to 60° (Bruker AXS, German). Thermo-gravimetric analysis (TGA) was conducted using a thermo-gravimetric analyzer (Q50, TA Instruments, USA). MAM and sodium persulfate were mixed in an appropriate ratio into distilled water and stirred for 15 min to obtain a uniform solution. Then, a set amount of MCC was placed in the solution in a 100-mL flask. The reaction was conducted at 60 °C for 5 h. After filtration, the sample was extracted with distilled water for 48 h to remove un-grafted MAM monomers and homopolymers. Then the sample was dried and stored in a desiccator for further study. The grafting yield of MAM modified MCC (MAM-g-MCC) was 11%. And the reaction process is illustrated in Scheme 1.
where [Cl] is the chlorine content of the sample (%), Vs and Vc are the volumes of sodium thiosulfate solution consumed in titration, respectively (mL), N is the normality of the aqueous sodium thiosulfate solution used in the titration (equiv/L), and Ws is the weight of the chlorinated MAM-g-MCC sample (g). The chlorine contents of the chlorinated MAM-g-MCC sample increased with the increase of grafting yield. However, the antibacterial efficacy might do not show same trend since the efficient antibacterial activity of N-halamines is related to the hydrophobicity of antimicrobial materials after chlorination (Liu et al. 2013). The chlorinated MAM-g-MCC was tested for the retention of antimicrobial functions under storage conditions by measuring the chlorine loadings of the samples. Chlorinated MAM-g-MCC samples with known chlorine contents were stored in a dark environment at ambient temperature, and the chloride contents were periodically tested throughout the storage period. MCC, MAM-g-MCC, and chlorinated MAM-g-MCC samples were challenged with gram-positive bacterium S. aureus (ATCC6538P) and gram-negative bacterium E. coli O157:H7 (ATCC 11229). 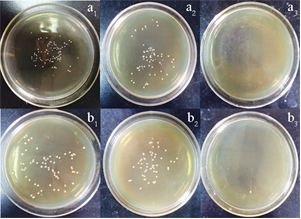 Bacterial suspensions with 5.01´105 CFU S. aureus and 1.82´106 CFU E. coli O157:H7 were added to phosphate buffer solution containing 0.1 g of tested sample. The mixtures were sonicated, vortexed, and shaken for several minutes. After contact continued for a predetermined duration, sodium thiosulfate solution was used to quench the oxidative chlorine. The quenched samples were diluted several times and the dilute solutions were placed onto agar plates. Two repetitions of each dilution were performed. The plates were incubated at 37 °C for 24 h for final confirmation of the antibacterial activity of the tested samples. The surface morphologies of MCC and MAM-g-MCC were investigated by SEM. SEM images with magnifications of 500 and 1,000 times are shown in Fig. 1. MAM-g-MCC had a relatively rough surface compared to that of MCC, indicating that MAM monomers were successfully grafted onto the MCC surface by radical polymerization. In addition, the images showed that the microcrystalline cellulose was of micro-scale size, in the range of 50 to 80 μm. 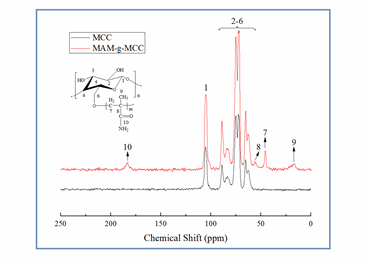 Figure 2 shows the FTIR spectra of MCC and chlorinated MAM-g-MCC. 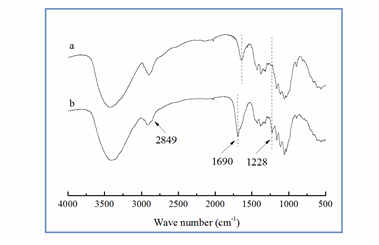 Compared to MCC, chlorinated MAM-g-MCC exhibited new peaks at 1,228, 1,690, and 2849 cm-1, which can be attributed to the stretching vibration of the C-N group, the amide band I (C=O ), and the C-H vibration of the CH3 group ascribed to the grafted polymer MAM (Shang et al. 2013), respectively. In this study, the C=O band shifted to 1690 cm-1 after chlorination, close to the reported position of 1,670 cm-1 in the literature (de Santa Maria et al. 2003). The shift was attributed to decreased electron density on the nitrogen atom when the amide structure –C(O)-NH2 in the grafted polymer MAM was changed to –C(O)-NHCl, reducing its contribution to the resonance structure –C(O–)=N+HCl and consequently increasing the C=O double bond composition by shifting the FTIR band towards higher wavenumber (Liu and Sun 2006). This shift can basically demonstrate the formation of N-Cl bonds after the chlorination reaction. In addition, no significant change was detected for the band located at 3,400 cm-1 in either of the two samples, which was mainly assigned to the O-H stretching vibration in the cellulose backbone. The 13C NMR spectra of pristine MCC and MAM-g-MCC are presented in Fig. 3. It can be seen that the most intense signals, between 60 and 110 ppm, were those from cellulose backbone carbon atoms. In particular, the signals from 60 to 67, 80 to 92, and 100 to 110 ppm were assigned to C6, C4, and C1, and the signals from 70 to 80 ppm were ascribed to C2, C3, and C5 (Martins et al. 2006). The signals at 17, 46, 56, and 183 ppm were assigned to the carbons of the –C-CH3 (C9), –CH2-C- (C7), -CH2–C– (C8), and C=O(C10) groups, respectively (Shang et al. 2013; Altin et al. 2014). These signals further confirmed that MAM was successfully chemically bonded to MCC. where I1 is the minimum amorphous signal intensity at the position 2q = 18° and I2 is the intensity associated with the crystalline region of cellulose at position 2q = 22.6°. Based on the XRD analysis, the calculated crystallinity degrees were 82% for MCC and 80% for MAM-g-MCC, suggesting that the crystalline structure of MCC was essentially maintained. No difference was observed in the degree of crystallinity after modification of the cellulose surface, confirming that the modification occurred only at the nanocrystal surface. The thermal stability of pristine MCC, MAM-g-MCC, and chlorinated MAM-g-MCC was investigated by thermogravimetric analysis (TGA), in addition to derivative thermogravimetry analysis (DTG), and the results are presented in Fig. 5. The TGA curve of pristine MCC exhibited two different stages of weight loss. The first stage extended from 40 to 120 °C, and maximum weight loss rate (Tmax) was at 65 °C, according to the DTG curve. This weight loss corresponded to the volatilization of water adsorbed or bounded on MCC (Li et al. 2013). The second stage of weight loss began at 240 °C and was due to the decomposition of the macromolecular chain and the degradation of saccharide rings; Tmax in this stage was at 351 °C (Chen et al. 2011; Liu et al. 2014). The weight loss of MAM-g-MCC was very similar to that of pristine MCC, indicating that the grafting of MAM did not affect the thermal performance of MCC. As for the chlorinated MAM-g-MCC, there was relatively low weight loss at 165 °C as a result of the presence of covalently bound chlorine. The weight of the sample decreased with increasing temperature. The weight loss could be attributed to the degradation of the saccharide rings of MCC and the macromolecule chains carrying N-halamine groups. The Tmax of chlorinated MAM-g-MCC occurred at 334 °C, which was lower than that of pristine MCC (Tmax 351 °C) and MAM-g-MCC (Tmax 341 °C). The decomposition of the N-Cl bond at 180 °C most likely accelerated the thermal decomposition of the cellulose backbone, leading to weight loss from chlorinated MAM-g-MCC at relatively low temperatures (Chen et al. 2007). The storage stability of the chlorinated MAM-g-MCC was tested in a dark environment at ambient temperature, and the results are shown in Table 1. After 90 d of storage, over 60% of the oxidative chlorine was retained and almost all the oxidative chlorine lost could be regained after rechlorination. a The error in the measured [Cl] value was 0.02 %. b C, chlorinated before storage test; R, rechlorination after storage test. The biocidal efficacies of MAM-g-MCC and chlorinated MAM-g-MCC were tested, and the results are shown in Table 2. The untreated MCC was used as a control. MAM-g-MCC caused small log reductions of S. aureus and E. coli O157:H7 after 120 min of contact duration. The small log reductions were mainly due to adhesion of the bacteria to the surfaces of MCC and MAM-g-MCC. By contrast, the chlorinated MAM-g-MCC could inactivate 100% of S. aureus 5.01´105 CFU per sample and E. coli O157:H71.82´106 CFU per sample within only 10 min of contact duration. The bacterial colonies on the plates are shown in Fig. 6. Clearly, neither MCC nor MAM-g-MCC provided significant antibacterial activity. The chlorinated MAM-g-MCC sample showed that there was no growth of bacteria, both S. aureus and E. coli O157:H7, after 10 min of contact time. This efficient antibacterial property was due to the oxidative chlorine formed by the chlorination of the N-halamine precursor. The oxidative chlorine was transferred to the cell membrane, reacted with receptors in the cells, and inactivated the microorganisms (Chen et al. 2007). aInoculum: 5.01´105 CFU per sample; bInoculum: 1.82´106 CFU per sample. Methacrylamide was successfully grafted onto the surface of microcrystalline cellulose. The modified microcrystalline cellulose was characterized by SEM, FTIR, solid NMR, and XRD spectra. The results indicated that surface modification by grafting polymerization did not change the degree of crystallinity of the MCC. After chlorination, the modified microcrystalline cellulose became biocidal with good storage stability and could inactivate 100% of aureus (log reduction 5.70) and 100% of E. coli O157:H7 (log reduction 6.26) within 10 min of contact time. The results indicate that antimicrobial, modified microcrystalline cellulose could be used as a potential antibacterial material in water disinfection and healthcare applications. This work was supported by the Graduate Student Innovation Plan of the Jiangsu Province of China (KYLX-1142), the Project for Jiangsu Scientific and Technological Innovation Team, and the research fund from the Science and Technology Department of Jiangsu Province of China (BY2014023-09). Article submitted: May 21, 2015; Peer review completed: July 20, 2015; Revised version received and accepted: October 27, 2015; Published: November 19, 2015.